A Japanese city devastated by the 2011 tsunami disaster remains mystified more than two weeks after receiving anonymous gifts of gold bars worth over $300,000.A fish market in Ishinomaki, some 350 kilometres (220 miles) northeast of Tokyo, received a parcel containing gold bars weighing a total of two kilograms (4.4 pounds) in early February, about a month ahead of the disaster’s second anniversary on March 11. Kunio Sunow, president of the Ishinomaki Fish Market which was destroyed in the disaster, said he casually opened the mystery parcel addressed to him. “I was stunned because… in there was 24-carat gold in two plates,” he told AFP on Friday. “We don’t have to identify this person of goodwill… but we want to let them know we are grateful. If possible, I want to invite him or her to the completion of a new market” set for early 2015, he added. More gold bars were sent to other area organisations. They were mailed from Nagano, northwest of Tokyo, in packages which contained only the word “assistance” on the inside. “We couldn’t be more grateful,” said Seitaro Omori, who works for Manbow, a pubic-private company helping rebuild Ishinomaki. Omori said handwriting on all the parcels appeared to be the same, suggesting one good Samaritan was behind the gifts. Some of the bars were wrapped in pages from a health magazine for seniors, he added. Over at the Ishinomaki Revival Support Network, the shiny gift sparked disbelief. “I opened the mail half-worried as it was heavy… and then everybody in the room said ‘Wow!’,” said Yoshie Kaneko, who heads the non-profit group. Ishinomaki was devastated by the 9.0 earthquake and massive tsunami it generated on March 11, 2011. The disaster killed nearly 19,000 people, including more than 3,000 in Ishinomaki, and sparked the world’s worst nuclear accident in a generation. 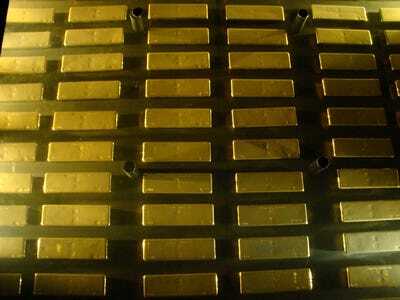 At current market prices, the total of six kilograms of gold bars could be worth more than $300,000.